American Sycamore (Planetree, Buttonwood, Platano) - Plantanus occidentis - A mature specimen can be breathtaking. 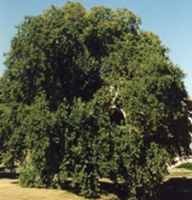 Grows into a massive shade tree with maple tree like leaves and mottled white and grey bark which peels in strips from the trunk. It is a favorite street tree. Fall foliage is yellow. The sap is collected and used to produce a syrup (rather like maple syrup). The bark is astringent and is used to treat cough, colds, dystentery, and as a wash for wounds. Hardy to -30F (-34.4C); height: 100ft. London Planetree - Platanus acerifolia - A naturally occuring cross between P.orientalis and P. occidentalis, this species is a large tree that can attain an 80 foot height and breadth. It has attractive peeling brown bark, revealing white patches. A very tolerant tree, it does very well in city environments. Fall foliage is yellow-brown. Hardy to -20F (-28.8C); height: 80ft. Oriental Plane Tree (Cut-leaf Plane Tree, Platano, Chenar) Platanus orientalis - Native to Asia Minor to Iran, this species is very like its cousins, P.occientalis and P.acerifolia. The bark peels in the same manner and the tree is approximately the same height at maturity, though it is less cold hardy. The leaves of this species are more deeply lobed, looing more like those of maple tree, and the wood is very hard and durable, being a favorite for butcher's blocks. Hardy to 10F (-17.7C); height: 80ft.